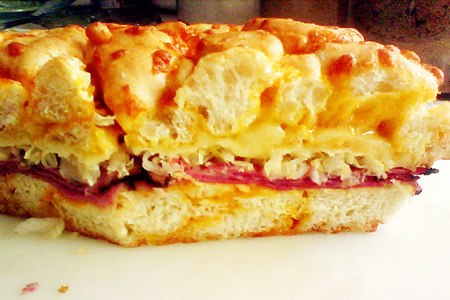 What do you get when you combine cheese bread, Angus pastrami, Swiss cheese, sauerkraut and honey mustard? You get a great light lunch! Well, that's all true, except the light part. This monster is quite the caloric indulgence. Have a recliner or cot handy. This isn't so much a typical recipe, but just a quick run-through of the making of this monstrosity. Slice the loaf of cheese bread in half horizontally. Slather the inside of each half with a thin coat of honey mustard. 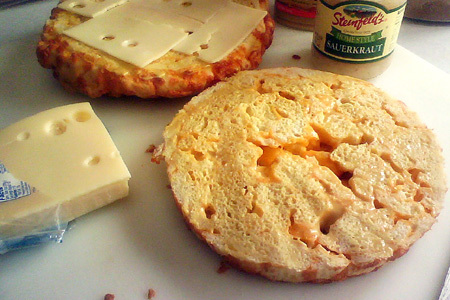 Add sliced Swiss cheese to the top. Cover the entire bottom with two layers of sliced pastrami. 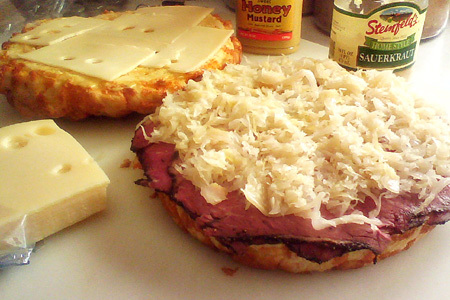 Top the meat with a nice layer of drained sauerkraut. Put the bottom (meat laden) half on a sheet pan and broil (center rack) for about five minutes. You just want to take the chill off of the meat and dry the kraut a little. Turn the oven to bake at 350º and add the top (cheese side up, of course) to the oven rack and bake five minutes. Slide the oven rack out and carefully turn the top over onto the bottom. Note: I apologize for the poor pictures. The good camera wasn't available. I made this with kaiser rolls and it was fantastic. I made my own honey mustard with creole mustard and honey! Yum!